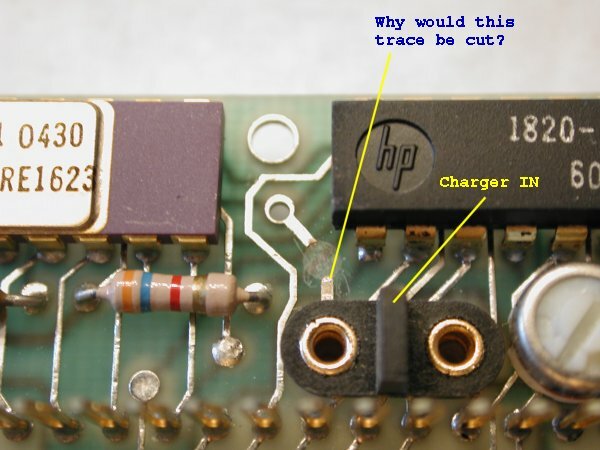 HP-27: Why would this trace be cut? Message #1 Posted by Mike on 9 Aug 2002, 3:31 p.m. I got my HP-27. It did not have any of the problems that the seller said it had. Must have been related to the tiny bit of corrosion on the tip of the battery contacts. I cleaned that off and it worked. All except the decimal points, which were always on. So, I opened it up to see what the problem might be. After I put it back together it worked 100%. Lucky! However, while it was open, I noticed something odd. There was a trace that was cut. Was this just a factory modification (change)? Are all 27s like this? Could this be something that a previous owner did? Why? Everything seems to work 100%. It even charges properly. The trace comes from the AC Adapter pin. Re: HP-27: Why would this trace be cut? this "all decimal points on" situation means running in low battery. As you disassembled and reassembled it and it turned into normal operation, chances are you had just a bad contact in one of the power lines (or connections on it). By looking at the photo, it seems the cut was drill made (by hand?). I do not have any HP27 in hands, and I had an HP22 (no longer with me). In my HP25 I see the resemblance, except for an electrolytic capacitor that is soldered right bellow the 3.6K resistor (orange, blue, red). On it, the copper trace is not interrupted, and it works fine. I know it does not help much, but I noticed there is no capacitor in your board. Should you verify if there is any sign if some component was removed? In your photo, right bellow the resistor (a bit to left), there is what seems to be a desoldered component pad. Is it corect? All the 27's that I've seen are like that. I think it was either a manufacturing mistake that was corrected during assembly, or it was an intentional reuse of an existing circuit board -- like from a 25. The 27 is subtly different from the 25 as far as circuit board traces are concerned. These difference were needed to deal with the different voltages for PMOS vs NMOS. The circular trace cut is made by using a hand trace cutting tool. It used to be a very common tool for working on circuit boards, they sold them in several sizes for different width traces. It’s sort of like a counter-sink drill bit. Are you sure you have a 27? Not sure what to make of this. I have checked all the functions and they all work. I seem to remember seeing three different HP27 logic board layouts.